Touting a particular expertise at your shop isn’t necessarily a bad thing. It can lead to becoming known as the go-to place for a certain service or specialty. On the other hand, you don’t want to be pigeon-holed so narrowly that you’re overlooked for bread-and-butter maintenance work and ready consumables like tires and oil – that would be a bad thing. Montgomery Motorcycle in San Clemente, Calif., has solved this dilemma. The dealership’s “specialty” is everything! Naturally, the shop does basic service and repair, but they also handle complete restorations, fabrication and custom builds. And not on limited makes and models, either. They work on all vintage American and British motorcycles, most Japanese makes, along with any late-model V-twin or sportbike you roll in on. Anything! That wasn’t the initial plan, though. 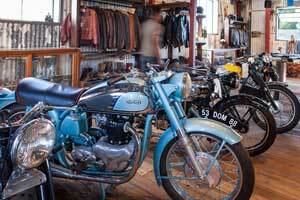 Mark Williams, the shop’s original owner, started the business in 2012 as a hobby to work on his own vintage Brit bikes. 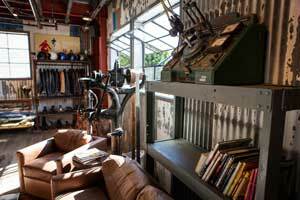 As a successful contractor and set builder, he recognized the character present in the building he occupied, an old transmission shop. He “cleaned it up” with corrugated siding that rusts only to a certain point, using some of the building’s original siding inside, too. It was a cool concept for a shop. 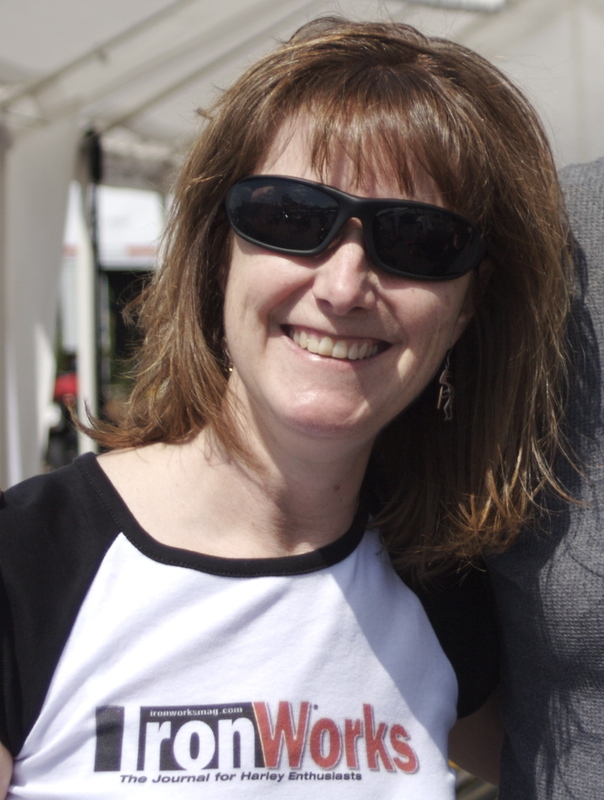 In casting about for a name with British overtones, Williams learned about Montgomery Motorcycles, a pioneering British bike manufacturer that operated between the two World Wars. Its founder, one William Montgomery, is credited with the invention of the sidecar. That was solid heritage and the name stuck. Williams met Martin as the shop was coming together and asked him to consult on equipment and set-up. Before long, Martin was the shop’s head tech and though he embraced the initial concept, his experience told him the focus was too narrow. 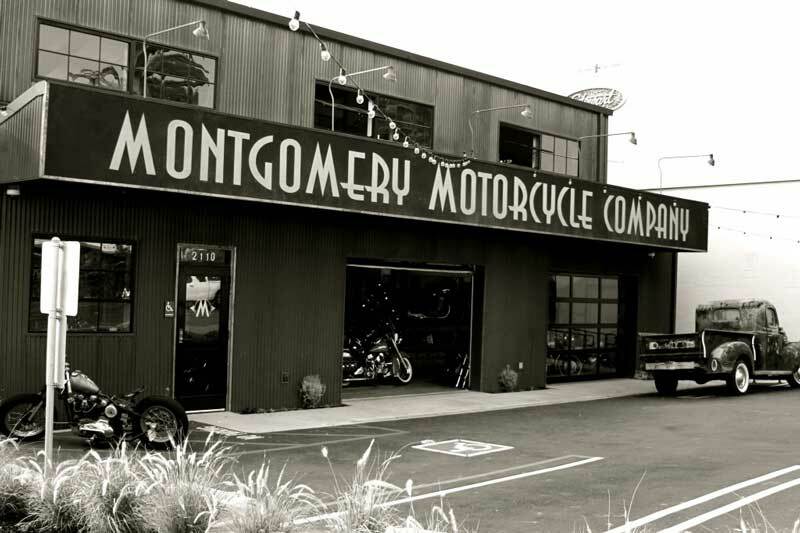 Martin’s expansive background, California’s Montgomery Motorcycles soon developed a following, due not only to its broad capabilities, but also its eclectic vibe. Anything goes here; you’re welcome and accepted no matter what you ride. 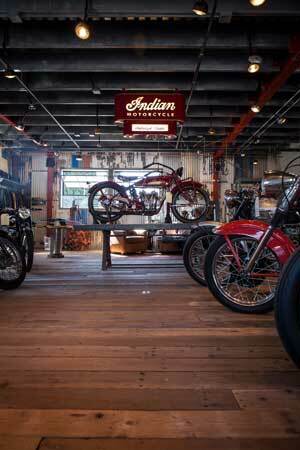 At Montgomery Motorcycles it’s all two wheels. “On an average day we could have a ’69 Triumph Bonneville on one lift, on the next a 2015 Harley Street Glide, and on the next a new sportbike, dirtbike or an Indian from the 1930s,” said Martin. But, he adds, “If you want to make money servicing motorcycles you need to be working on Harley-Davidsons. The guy who has money to buy a Street Glide has money to keep it running well.” Though he enjoys older bikes, Martin admits it takes time to research and source parts; more time than you can usually bill, but it’s still fun. Because of its proximity to the massive Marine base at Camp Pendleton, Montgomery caters to military riders. Along with parts and service discounts, the dealership offers a Deployment Special that keeps a bike on a Battery Tender, under cover and maintained, until the Marine returns home. It costs less than a storage unit and owners often ask the shop to install new parts and upgrades they find surfing the Web while deployed. “We like taking care of those guys,” said Martin. And his customers are all over the map with many in the 18 to 30 year old range. Martin sees many of these riders choosing American bikes such as Ironheads and newer Sportsters. Café racers are still making the scene and Brats are popular, too, he said. Based on Honda CBs of varying cc’s, Brats have taper style bars, a flat small seat and enduro type tires—instead of the café’s clubman bar and seat cowling. Our thoughts? That’s brilliant, mate!